Celebrate your special occasion in style with gorgeous handmade SINGLE LETTER MONOGRAM cake topper that you and your guests will love! It can be a beautiful addition to your cake for any occasions - Wedding, Anniversary, Birthday, Bridal Shower, Baby Shower - you name it! PLEASE REFER to PICTURE #4 TO SEE THE DESIGN FOR ALL LETTERS. * Each topper carefully sanded, painted, and glittered (if selected) on BOTH SIDES. * The glitter DOES NOT fall off :). Our glittered toppers are entirely covered with food-safe sealant. * Each topper's stick is covered with a food-safe shellac finish. * 5", 6" wide ( 2-6" tall, depending on topper), 7", and 8" wide (3-6" tall). * They perfectly fit 5" to 8" cakes but can work for a variety of sizes! * If you need a different topper size, please let us know - we love custom orders! OUR PRODUCTION TIME for a single letter monogram toppers is 3-6 business days. EACH CAKE TOPPER is made from light but sturdy 1/8" thick birch wood. Every piece is handmade and carefully crafted from top quality materials. You can choose a natural wood cake topper or one that is hand painted with the color of your choice! SHIPPING: We ship via First Class (2-5 days shipping time) or Priority Mail (2-3 days shipping time) . You can select your shipping service at checkout. INTERNATIONAL SHIPPING time will vary, and usually takes 2-3 weeks for First Class Mail packages. Faster delivery options available per request. PLEASE NOTE: Actual color of wood and color finish will vary slightly, and your individual monitor settings may affect the colors of the image. 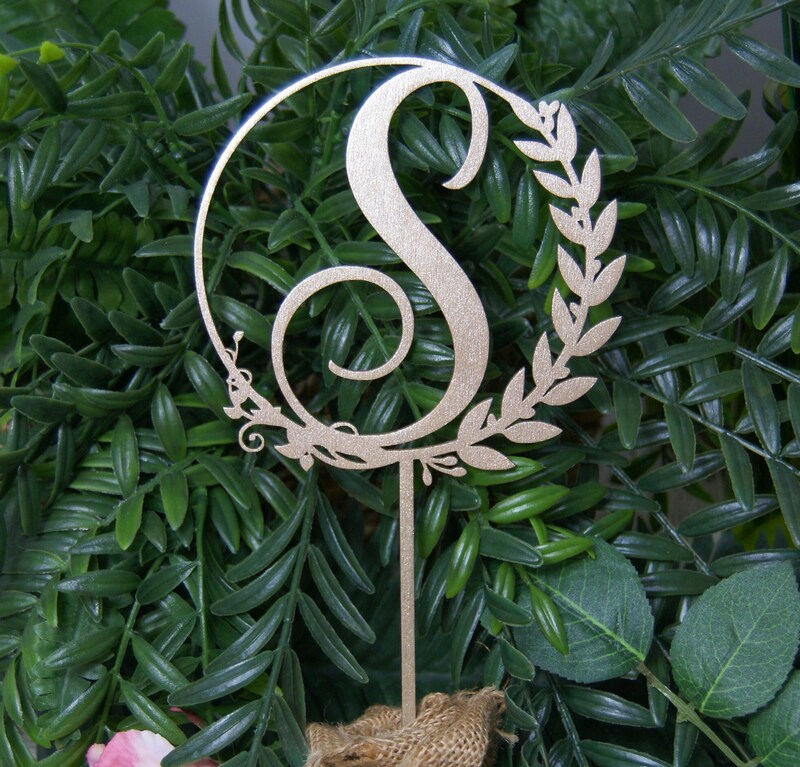 Due to these variables, the exact shade of your cake topper may not be exactly as shown. Perfectly made. Cannot wait to top our cake with it. Thank you! Haven’t taken it all the way out because I don’t want it to get damaged before the wedding! It is just like the picture, and I couldn’t be happier with it! We accept credit cards via Etsy Checkout and PayPal. Because each of our products is made to order and custom- cut or engraved, we can issue refunds only before we have made your item. Once the sketch is approved and we have completed and shipped your guestbook, keepsake box or cake topper- we will no longer be able to issue a refund. Once you place your order, we will make your item and ship it within 5-7 business days, unless different time frame specified. You can select the shipping method at the checkout.